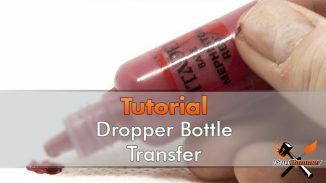 Do you want to know how to transfer your Citadel Paints into dropper bottles? 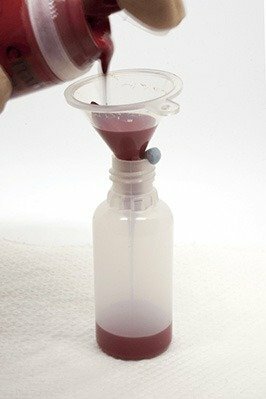 Plenty of people have made this same post about transferring or decanting Games Workshop paints into dropper bottles. But I wanted to bring it up to date and show what I have found to recover as much paint from you original paint pot as possible. This article was first posted on 13th December 2016 and has remained the most popular post there has ever been on this blog. With my mini stripping guide and DIY Dice Tray coming in close Second and Third place. I have received lots of great feedback over the last year and a half. 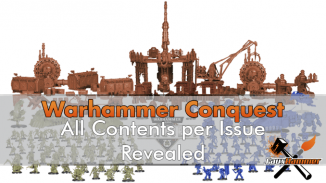 So I have significantly updated the article with the input of many great people in the community. Thank you all. If you have an idea of any improvement I could make, please share it in the comments below, or anywhere else I have shared this guide. 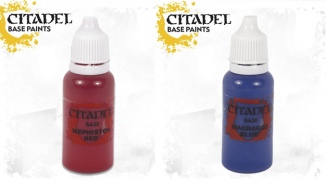 Transferring Games Workshop Paints into Dropper Bottles – The Why? First of all, what are the reasons for doing this? Well, a lot of people will say, “there is no point” or “you waste paint doing this” (not true). 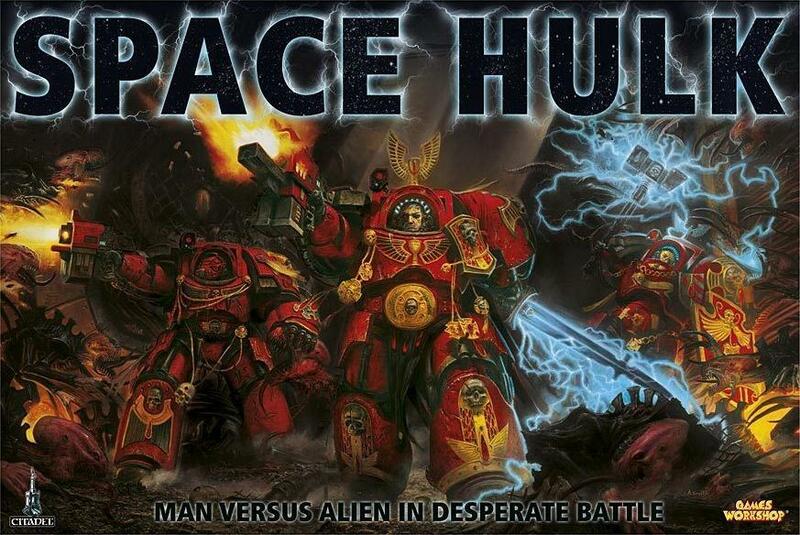 And my personal favourite, “Don’t buy sucky Games Workshop paints in the first place, Buy Vallejo”. Sigh! 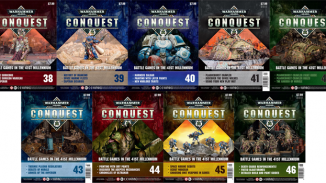 Some people like the Games Workshop colours, I like the Games Workshop colours. 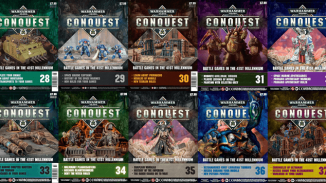 but more importantly, before I learned there even were other options I was heavily invested in the Games Workshop colours. Sure, you can get some control with your small brushes, but the main thing is you can add paint drop-by-drop and you don.t need to wash off a brush afterwards, keeping you water pot a bit clearer. How many times do you see 4:1 ratio of X paint to Y paint? Easy now, 4 drops of one and 1 drop of the other. You can even add water to a bottle to get accurate paint to water ratios. Ok, so the volume of paint is pretty much the same,and the botteles are technically larger (15ml over 12ml). But the diameter of the base is much smaller on the bottles. If you have only one flat surface to store paints on you can get many many more bottles than Games Workshop pots. These things aren’t perfect and may eventually get clogged. But you can easily pop off a spout and/or replace the lid if it is getting too thick with paint. Or, just try to remember to wipe the excess off the spout before you put the lid back on. Ok so this point is more of an opinion than a fact. There’s something about the bottles that just make them look a whole lot tidier than the Games Workshop Pots. Yes, you lose a bit in the transfer but a lot less than you would lose by it drying out in the pot. My paints have been in bottles for over a year and a half now and are still nice and fluid. Sure you can add an agitator to the Games Workshop pots. But because the neck of the pot is a smaller diameter than the base, when you shake the pot your agitator will not get into the corners. 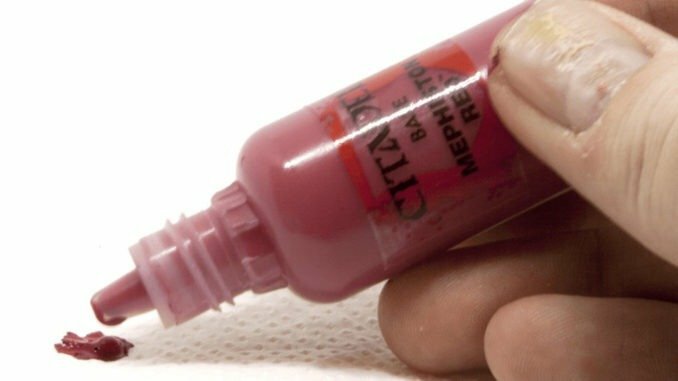 With a bottle, the sides are parallel and the base is a smaller surface area, chances are your agitator will have more likelihood of striking settled paint and getting it to flow again. 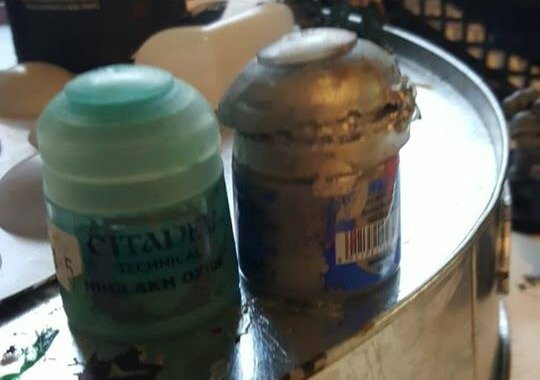 The best example of the benefit to dropper bottles (other than the numerous pictures of spilled Shade pots out there) is the below photo from one of my readers in the “40K Death Guard Players – Plague Marines Of Nurgle” Facebook Group. To follow this method, there are a few necessities you will need, there are some other things you should have to hand (such as water) but the main items are listed below. In the UK, I bought these exact Dropper Bottles (take note of the shape of the spout, this will be important later). Some people have reported the poor mould quality on some bottles they have bought. Which has meant they needed to trim some mould lines from the base of the bottle so they actually stood up. I’ve had no issue with these. The only parts that had any extra mould were the necks of the lids. 100 x 15ml bottles were £9.99. The only downside is that they took over a month to arrive (my fault for not checking shipping times before buying). A note about Vallejo Bottles. Many people may want to match the Vallejo range with 17ml bottles and have a more uniform paint rack. But for some reason (probably because this is an odd size only Vallejo use en-masse) the 17ml bottles are about £1 per bottle! 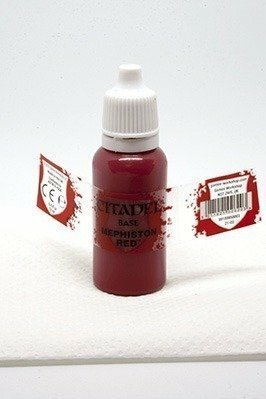 15ml bottles will fit all of your Games Workshop Paint (a standard pot only contains 12ml (ish)) and as I said you can get 100 for about £10. 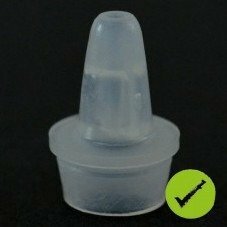 Whatever bottles you buy, make sure they come with the spouts pictured in the main post image as some of the come with really thin spouts which are more commonly used by people who smoke/vape e-cigarettes. 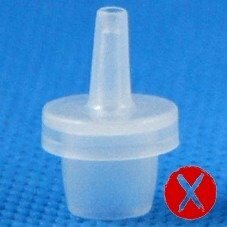 When you buy the Dropper bottles, many of them come with some plastic funnels If you buy a large enough quantity, Great! If they don’t, You could make your own Funnels out of paper, but I think these plastic ones are much sturdier and I’m glad I bought some. You can use water to rinse the final dregs of poured paint out of them into your bottle. 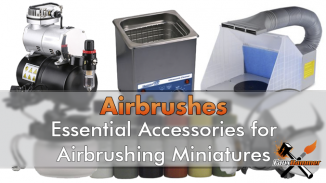 They’re also very easy to wash or even strip the paint from them when you’re done. With paper ones, you have to make them, you;re more likely to spill and they start to break down when wet. x10 plastic funnels costs about £1, and for me they arrived within 15 days (unlike the bottles themselves which took over 30 days to arrive). Either High-Grade 6mm Stainless Steel Ball Bearings, High-Grade Stainless Steel M3 hex nuts or glass beads. If you don’t get “High-Grade Stainless Steel” Ball Bearings or Hex Nuts they will rust in the pot, ruining your paint. Nuts can often work out cheaper and because of the shape, they shouldn’t get stuck in the spout and restrict the flow of paint. The issue here is that if you buy from eBay, you are at the mercy of the seller’s honesty. I bought these exact ones from a reputable seller, and they were quite expensive. At £10 for 100 they were just as much as the bottles…..
An alternative to Stainless Steel (and to avoid a shoddy seller not selling true Stainless Steel causing you to get rusty paint) is using Glass Beads. This was pointed put to me by a guy in the ‘Eavier Metal Facebook Group. Not only will they not rust, but they are also far cheaper than Metal Ball Bearings. 100 6mm beads are only £1.29. I wish I knew about this before. These, however, have the risk of shattering in the bottle as you shake them. This is a low risk as I only know of 2 occurrences where this has happened (Don’t get the Crackle Effect Beads, get solid ones). Each person who reported it to me only had this happen to them once. Glass beads are also not as heavy as ball bearings. So if your paint has started to dry out, you may find the bead getting stuck and unable to shake itself free. 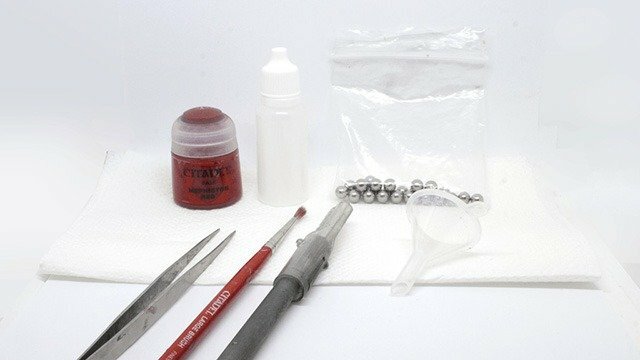 Transferring Games Workshop Paints into Dropper Bottles – The Tools you already have (most likely). You’re gonna want to move those Agitators out of your pots without getting your fingers messy. At least a couple of rolls. You have one/some anyway no doubt. Something to stop the funnel from sitting too far into the neck of the bottle and stopping airflow. Prepare your work surface by laying down some kitchen roll. You aren’t going to accidentally pour paint on your desk anyway, are you? let’s hope not, but just in case. Prepare your bottle and funnel. These Funnels are the perfect size for the bottles, too perfect. When placed in the bottle they pretty much create an airtight seal around the bottle neck. Meaning, as you pour paint in the funnel, the air in the bottle has nowhere to escape to, so the paint just sits in the funnel. This is why a small bead of Blu-Tack is placed on the edge (softly) to create enough of a gap for the air to escape. Shake your paint, well! Depending on the paint, I sometimes put an agitator in now to help mix it. This depends on the age of the paint, how long it has been sat unused and what type it is. Base, Layer, Edge, this can have an effect on how thick the paint is and how much of the really thick pigment has settled at the bottom of the pot. Either way, mix the paint as well as you possibly can. Pour. I’m not sure how much advice I can give you here. “Be steady”, pretty much sums it up. Shades pour straight in, Some Layer Paints pour very easily, but some are thick and clumpy (Damn You White Scar! 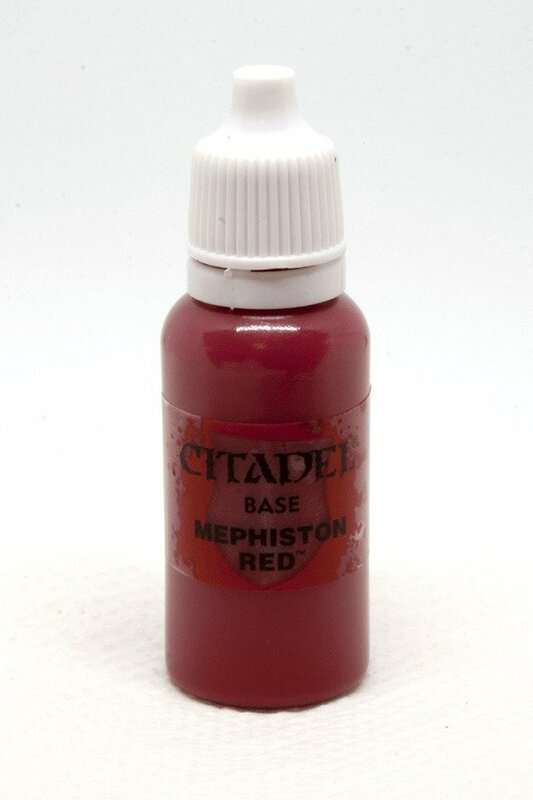 ), Base paints like Mephiston Red are very very thick. Just pour it nicely into the Funnel until the funnel is about 80% full. If the paint keeps flowing through the funnel, great, keep pouring. If it slows and you need to stop, then stop. Sometimes paints are so thick that they need some encouragement. You can use a paperclip, thin screwdriver or an old brush to get the paint flowing. Paint sticks to the brush though, you want it in the bottle. Note, if you used an agitator, try not to let this fall into the funnel, it will block the flow and then you need to fish it out blind with some tweezers. If this happens, get a paperclip down the side of it and swirl the paint around until it all goes through and you can see the bearing. The only other way is to messily transfer the paint to another funnel. 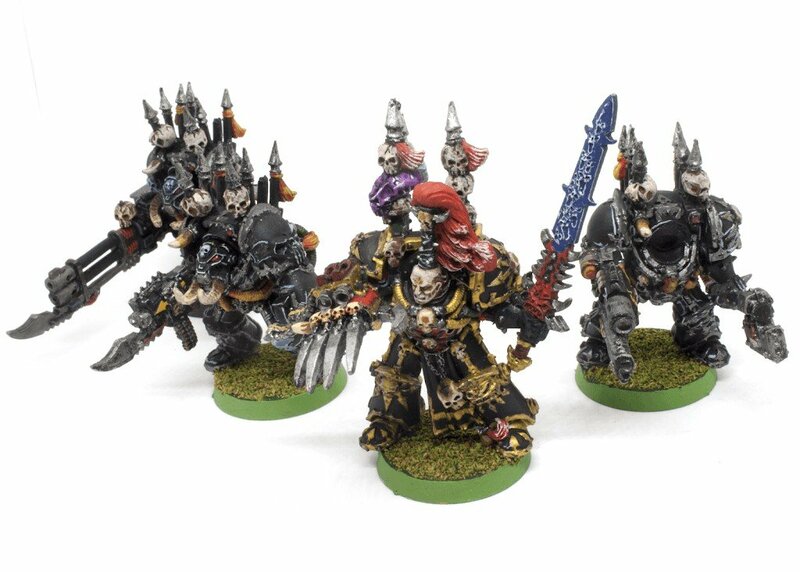 Note: One interesting thing I noticed, Games Workshop pots are advertised as 12ml, and these bottles hold 15ml. I’ve had some paints where I’ve added at least 1ml of flow aid, there’s almost nothing left in the pot and I still only have what looks like 8ml-10ml in the bottle. But other times I’ve simply poured the paint without any additional Flow-Aid, still had some left in the pot and have got clearly over 12ml. My Khorne red actually overflowed the bottle??? I don’t know if somehow the paint molecules have expanded/contracted with time. but it’s certainly not an even 12 ml in each pot. Also, do not do what I thought was clever on my first go an pour 12ml of paint and assume 3ml of flow aid (or water) will be a good mix. I killed my brand new Thousand Sons Blue, less than a week after Games Workshop released it! 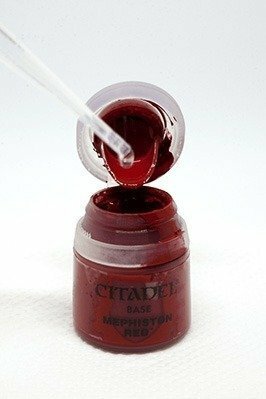 See Step 5 – Pour again, but this time, use your brush to encourage every last drop out of the pot, don’t forget to scoop paint of the lip of the lid into your watered down mix. This can be a touch (a drop of water or two) thinner than the paint you originally poured as you want it “all” out. 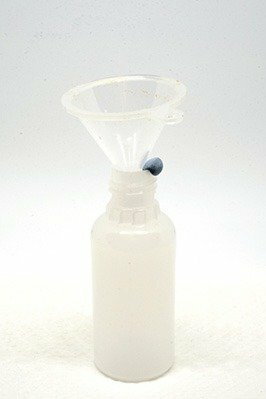 Then, to clean the funnel, dip the tip of your brush in some water and rinse around the funnel, getting as much as you can to pour into the bottle. Take the funnel out and dump it in a bowl of water. You can immediately go wash it out, but this whole process takes a while, I do it in batches of 10 (because I only have 10 Funnels). leave them in water to stop the paint drying and wash them at the end of that batch. I will be rinsing my brush during this process too, but I use my normal water pot for that. Pop the spout and lid on then marvel at your beautiful work. Wash them out. 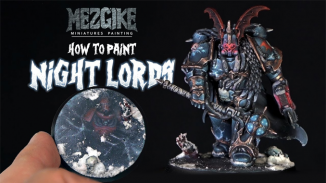 This is what I did and it works much better with washes, one problem with these pots is that the pot itself is quite hard plastic and you can easily scrape paint from out of the inside. except for under the lip. But the lid is really soft and I think a bit porous. When the paint sticks to it and gets pretty embedded. 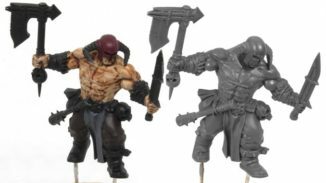 So removing it completely from the lid would require you to use something similar to what you would use to strip minis, but I don’t know what it will do to this plastic. I know what boiling water does, it shrinks it and makes it brittle. 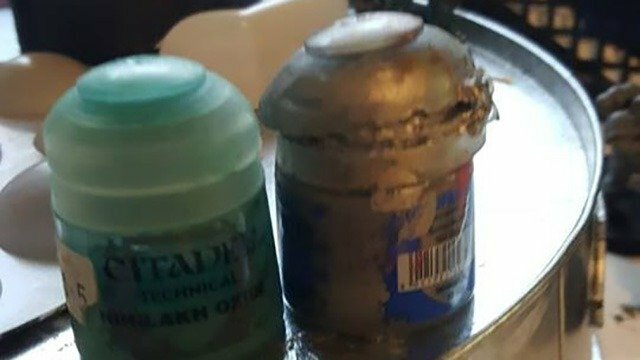 Washed pots can actually be sold on eBay! (some people like these things). You could use washed out pots to store mixes. I like to use the washed pots to hold some Airbrush mixes of these colours. Basically the same paint, but thinned with car screen wash or distilled water. You could continue using the pot until the paint fully runs out. You could put other modelling materials in like glue, flock sand or stones. If you have a lot of them, you could throw them in the bin. As advised by Paul Morris in the comments, use them as stands for you in-progress models instead of getting your fingers all over them. (Cheers Paul). Unless you want a propper hobby handle? Move the label, I like to peel the whole label off the pot then get it into position on the bottle. By doing this I’m not getting my fingers all over the sticky part of the label I’m keeping. Simply trim the edges of the label with your knife or scissors and use your fingers to smooth it out. Now give it a shake and test a it out. I trapped my thumbs in a vice when I was a kid and destroyed the nail bed. That’s why. All done, after your test drop, wipe the spout with your tissue so your lid doesn’t get clogged like the Games Workshop paint pots used to. Otherwise what was the point in all this? What did you think of this tutorial? please let me know in the comments. 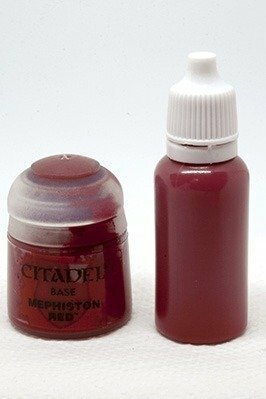 Guide: Games Workshop Citadel Paints in dropper bottles? 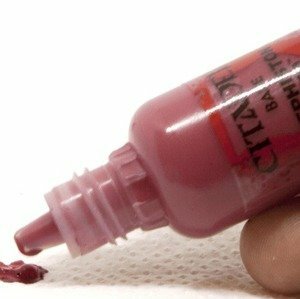 Interesting article, however I would like to know if anyone has experienced Vallejo paints going slimey, Black in particular. The paint hangs from the nozzle like snot ( forgive the expression but it’s the best similarity I can find). The paint thins and covers as normal but the water pot if left overnight will develop a thin slimey layer which hangs off the end of the brush. 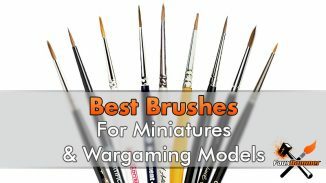 Thanks for your comment, Honestly, I’ve never seen this, but I always add an agitator to my paints, even Vallejo ones, before I use them. Another great cheap agitator is the size 4 round lead weights used for fishing. Lead won’t react with the paint and no, it won’t leech into your paint or anything assuming you don’t chew on the weights.